Thursday, May 30 at 06:30 p.m. Please note there will be an afternoon program commented en français at 1:30 p.m. and an evening program commented in English at 6:30 p.m.
Our Salon Series celebrates a certain art of conversation invented by free-thinking women in their Parisian salons during the Age of Enlightenment. After featuring Madame de Staël, the marquise du Châtelet, and the real Manon Lescaut, we now go back further in time to highlight women, composers, poets, and muses from the late Renaissance. These women, despite frequently being overshadowed by their male contemporaries, were often highly regarded by their peers for their impeccable training and musical ingenuity. Among the music featured is work by Italian-born Antonia Bambo, who set French poetry to music, as well as baroque harpsichordist, and composer Elisabeth-Claude Jacquet de la Guerre. With Nathalie Colas, soprano, and Deborah Fox, lute and theorbo. Poetry excerpts from Louise Labé (1524-1566) and Pierre de Ronsard (1524-1585) read by Isabelle David. Weather permitting, we will present this program in our lovely courtyard...and feel as if we were at the court of the King of France! 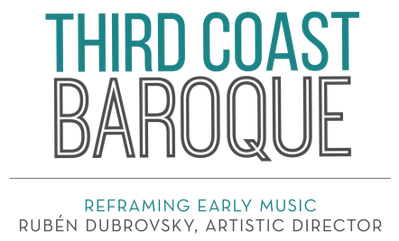 This program is presented in partnership with Third Coast Baroque. Hailed for her "floating, silky soprano" and deemed "a standout in acting and voice" (Chicago Classical Review), Nathalie Colas was born and raised in Strasbourg, France. She is a current soloist, and founder of Third Coast Baroque, Liederstube, and new music ensemble Fonema Consort. Nathalie was recently heard in Bach's St. Matthew Passion with the Valparaiso Bach Chorale and the Leipzig Barock Orchester, in Mahler's 4th Symphony with The Symphony of Oak Park & River Forest, and in the title role of Rita by G. Donizetti in Switzerland. Nathalie studied Art Song with the late German baritone Udo Reinemann. A graduate of DePaul University School of Music and of the Brussels Royal Conservatory, Ms. Colas completed her opera training at the Swiss Opera Studio/Hochschule der Kunst Bern. She was awarded first prize in the 2015 Music Institute of Chicago competition. Deborah Fox is a lutenist with a span of repertoire ranging from medieval to baroque music, as a soloist, chamber music player, and baroque opera continuo. She has performed with major early music ensembles and festivals from Newfoundland to Australia, including the Carmel Bach Festival, Glimmerglass Opera, Spoleto Festival, Opera Atelier (Toronto), Pinchgut Opera (Sydney), Concert Royal, Music of the Baroque (Chicago), and others. She performs as a regular member of the ensemble Fioritura, and often in recital with soprano Laura Heimes and countertenor José Lemos. She is the founder and director of Pegasus Early Music, and the director of NYS Baroque in Ithaca, and Syracuse, NY. Isabelle David is the director of Ecole Franco-Américaine de Chicago, and the author of the literary blog sur un livre perchée.